Food, Inc opens Friday, and reviews so far have been extremely favorable — for example, it has a 94% rating on Rotten Tomatoes. Here, in no particular order, are a bunch of reviews (including gasp! some negative ones from expected sources). The sheer scale of the movie is mind-blowing—it touches on every aspect of modern life. It’s the documentary equivalent of The Matrix: It shows us how we’re living in a simulacrum, fed by machines run by larger machines with names like Monsanto, Perdue, Tyson, and the handful of other corporations that make everything. Despite occasional episodes of spiritual uplift, the film cultivates a feeling of paranoia as it progresses, so that none of the printed nostrums flashed over the final credits ("You can change the world with every bite") can dispel the notion that we and the earth are permanently and irretrievably fucked. ... an essential, disturbing portrait of how the food we eat in America has become a deceptively prefab, even hazardous industrial product. Perhaps, as the film suggests, the industrial food complex has no regard for long-term public health and environmental costs. But if food activists continue to cling to unrealistic ideals--and atypical examples of success--and fail to confront the questions of cost and scale, then they will vindicate critics of the movement, who argue that this new era of food production is only for the privileged. No matter how much you know about this country's industrialized food supply, you will see even worse unintended consequences of allowing a few huge, profit-driven businesses to control so much of what we eat... As with so much else in the film, dots are connected devastatingly. I'm sure some critics will scream manipulation, but it's for all the right reasons. [Y]es, you have to see it. There hasn't been a film this important about American food production, and probably not about industrialized food anywhere. Viewers who haven’t thought much about how all that food in the grocery store got to be there will likely find it hard to toss a few packages of pork chops and some Froot Loops in the cart and call it a day. Even the fashion crowd is on board this new food revolution. Daisy Lowe shops the Union Square greenmarket when she cooks for her boyfriend and David Lauren has started growing strawberries, potatoes and arugula at his home in Westchester. "If you didn't [see this film] because you were interested in learning, you come out feeling like you're on a mission now to eat differently," Lauren said. After watching what goes into the meat in a hamburger, I don’t know if I can do it again. And if I can’t eat hamburgers, it’s going to be the great tragedy of my life. 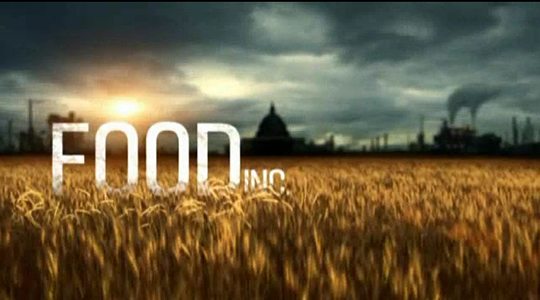 Food, Inc. is a one-sided, biased film... Food, Inc. is counter-productive to the serious dialogue surrounding the critical topic of our nation’s food supply. [S]haking a fist at the companies who provide millions of Americans with access to affordable foods won’t change anything. Last night’s panelists didn’t have much more to add. A few rambling monologues from Alice Waters were met with polite applause and some bewildered looks. Eric Schlosser lost us at “chicken nuggets shaped like Teletubbies.” But at least organic dairy giant Gary Hirshberg gave us some free yogurt.